We’ve all been in that situation before. The course load is overly heavy, the notes and printouts from lectures resemble a growing mountain on the edge of the study carousel. It’s too much to take in and you know you’ll never cover it all in time. And then when you’re in the exam hall, despite all the cramming, regardless of the colour-coded flash cards sitting at the bottom of your bag, you cannot remember a single thing. It’s a nightmare and one that can be easily avoided there are so many ways of remembering what you study that do not involve cramming and panicking. And no, its name isn’t rote memorization. See also: Apply to senior high schools and colleges online – for FREE! When it comes to remembering material, most turn automatically to rote memorization as if it was a reliable old friend. In truth, it is cumbersome, demotivating, and is quite possibly the least efficient way of retaining what you study. Rote memorization entails committing information to memory by brute force through repetition. But the key to remembering what you learn is comprehension, not memorization. Learning is about thoughtful exploration and logical discovery. Rote memorization, on the other hand, undermines all that by paving an easy path of instant recall without giving context to the information. As a result, many students remember facts without understanding how or why the information is relevant or important. These students fail to connect the information with other ideas. Consequently, new information will likely fall by the wayside and then into a black hole along with all the other unimportant details of your life like what you had for breakfast last October 15. So if rote memorization doesn’t cut it, what does? Don’t let the jargon scare you. All spaced repetition really means is reviewing important material repeatedly during study sessions scheduled in between incremental time intervals. While this might sound time-consuming, in reality it is an efficient method of reviewing material that takes advantage of the way the brain retains information. Any memory deteriorates over time but what truly astonishes is the rate at which it deteriorates. 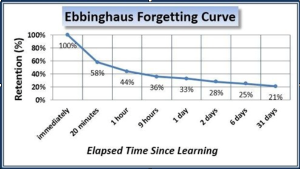 Nineteenth century psychologist Hermann Ebbinghaus extrapolated this rate into what is now popularly known as the ‘forgetting curve’. 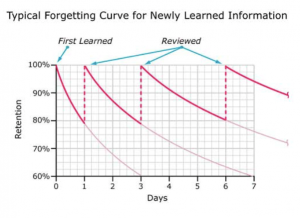 According to this curve, instant recall has a 100 percent information retention, but as little as one hour later retention decreases to a dismal 44 percent. This may sound like a nightmare to most students but there is a simple way of counteracting this effect and that is spaced repetition. By reviewing the material intermittently, the brain is given a chance to return to a state of instant recall several times, thus slowing the deterioration rate of the memory retention. Does that mean any material you study is doomed to the aforementioned black hole given enough time? Not necessarily. The more time you spend with the material and allow your brain to make meaningful connection between facts and concepts, the higher the probability the material would be committed to long-term memory. In practice, this means fleshing out and completing your notes straight after the lecture ends. This means writing down any questions you might have and asking your professor as soon as possible. 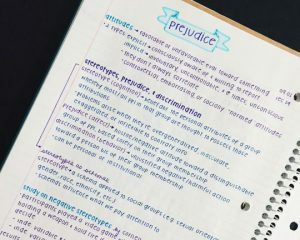 During the revision period, put down critical studying material on flash cards and review them every few days or so. People often think they remember more than they actually do. Do not get caught in this trap. Most students receive new information by listening to a lecture or reading from a textbook. The new material sits in the brain, only half-understood and then if Ebbinghaus is to be believed, it is almost completely forgotten by the end of the day. This is because a passive reception of information is rarely ever conducive to the creation of long-term memories. To combat this, students should reiterate the new material by making their own notes, quizzing themselves, or most effectively, teaching it to someone else. You can teach it to a fellow classmate, an unwilling roommate, or even to an un-listening audience made up of beer cans. It doesn’t matter. What matters is that the act of teaching it will compel you to sum up everything you know about the material, condense it in your own words and draw your own conclusions, thus promoting a deeper understanding of it. Teaching something will also force you to confront any present gaps in your comprehension of the material and address it. Information usually comes in two forms: facts and concepts. 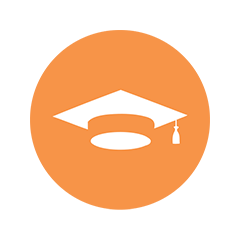 While education in pre-university days tend to focus heavily on recalling facts, at the university level students are expected to be able to analyze information, form opinions and argue their points. As a result, the ability to comprehend concepts is critical; not just memorizing definitions but to be able to consider the different facets of a concept and argue its importance (or lack thereof) in the larger picture. So pick a friend from a study group and teach each other difficult material. Utilize the Feynman technique, which involves explaining concepts in the simplest possible language. If you can boil down complex concepts simply, you can be assured of your own comprehension of the material. And when you comprehend it, you won’t forget it. When it’s time for revision period, here is an important question to ask yourself: “What is it that I don’t understand?” Before you say it, ‘everything’ is a lazy answer to that question. It’s better to figure out now where your weak spots are than to fret over it the night before the exam. Take out some time to pinpoint what you do not understand about a certain subject and then design a question that can address these gaps in your knowledge. With that question in hand, go to town with your lecture notes, your library books, even Google. Try not to get sidetracked by interesting trivia and information that might prove important. First and foremost, answer the question you have designed. Once you are confident in that answer, you can move on. Like the active reiteration, this approach is yet another way of encouraging you to understand concepts in your own terms, albeit a more targeted one. Paper is your friend, whether it be a hard copy of a textbook or notes on foolscap paper. 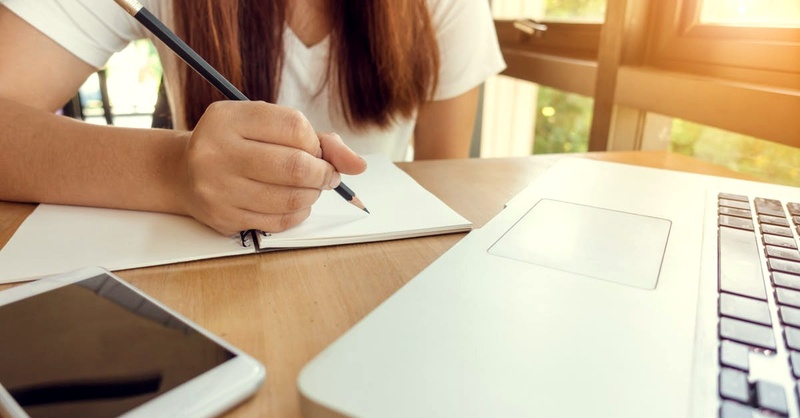 In a poll run in four different countries, 94% of university students revealed a preference for studying on paper because it made it easier to focus. Paper also gives you the freedom of making annotations in the margins, underlining, highlighting. According to research, these tactile aspects of active reading will help commit the information to memory and improve comprehension. Studying on paper also gives you the advantage of spatial memory, in which you remember a certain piece of information because you can recall where it had been written on the page. Texts onscreen promote distraction. The device on which you read any texts is in all likelihood a gateway to the Internet. Even a few seconds on Facebook, a break of your focus during your study session can be detrimental to information retention. In addition to that, reading onscreen for long periods of time leads to eye strain. Assuming that you have a lot of material to get through and you have set aside hours to do exactly just that, using a medium that is guaranteed to distract and demotivate you is very much akin to shooting yourself in the foot. So whenever you can, write out your notes, print out guides from lectures, borrow books from the library. “But what about the environment?” I hear you say. “We have to save the trees.” Yes, saving trees is important. 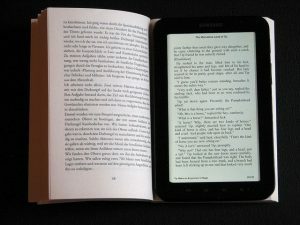 However those digital screens on which you are choosing to read your course material – the laptop, the smartphone, the tablet, or e-readers like the Amazon Kindle or Kobo – all those devices are made of non-recyclable material that is just about as unfriendly to the environment as cutting down trees. Trees can be replanted, but those toxic materials will remain on that landfill forever. So in truth, until a way is found to reduce the carbon footprint of manufacturing a digital device, paper is the greener choice. The human brain best absorbs information right before sleep, or right after exercise. Parents have often touted the importance of sleep for more effective studying, except now they have results to back up these assertions. Psychologist Jessica Payne discovered that memory recall improved if the information is rehearsed before going to bed. It is akin to telling your sleeping brain what it needs to consolidate. Dr Igloi of the University of Geneva claims that even a 90-minute nap is sufficient to help consolidate new information. According to her study, participants who napped after learning new content displayed higher activity in the hippocampus, the part of the brain that forms new memories. In short, sleep will help your brain make sense of and remember what you study. And when you wake up, go for a jog. In his book Spark: The Revolutionary New Science of Exercise and the Brain, John Ratey M.D. argues that exercise stimulates the production of a protein called BDNF (Brain Derived Neurotrophic Factor) that primes the brain for optimum learning as well as creative thinking. In effect, exercising right before studying improved one’s reading and comprehension abilities since the brain is more likely to form creative connection between ideas, thus resulting in a higher probability of retaining said information. So to create an environment in which your brain is most willing to comprehend and absorb information, undertake aerobic activity for about 20 to 30 minutes right before a study session. Exercising after studying can also help. Studies have shown that exercising four hours after studying helps with information retention by about 10 percent. While the scientific jury is still out as to reason behind this phenomenon, the fact is that physiological arousal has always aided the brain in remembering. 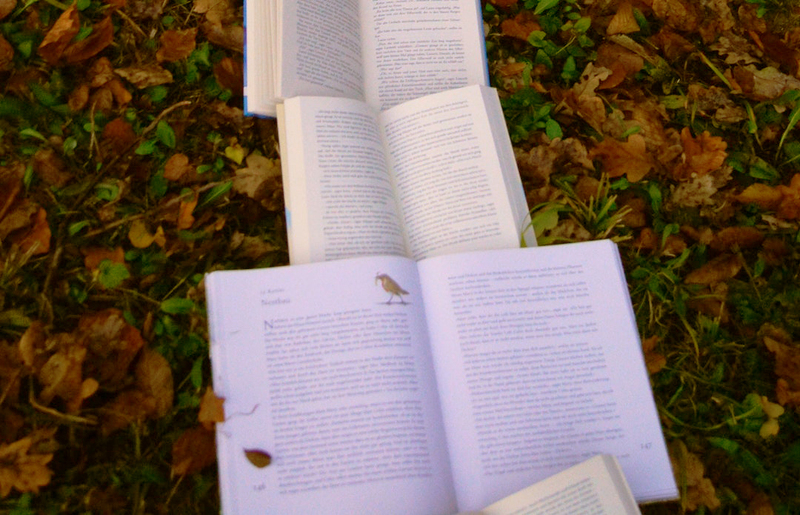 When cramming, cram in 25-30 minute chunks, interspersed with five minutes of rest. 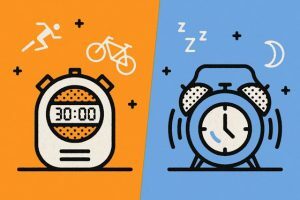 If you think that sounds familiar, that’s because it’s modelled after the Pomodoro Technique®, a popular time management method developed to eliminate distraction and bolster productivity levels. According to psychology professor Dr. Marty Lobdell, who gave a famous lecture entitled “Study Less, Study Smart”, the human ability to retain information tapers after 30 minutes. In this age of digital distraction in which the human attention span is calculated to be less than that of a goldfish, 30 minutes is an undertaking by itself, so do yourself a favour and try not to push it. It would just be a waste of energy. 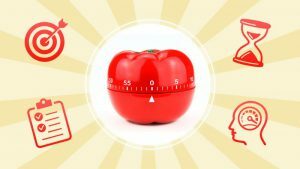 Use the Italian tomato clock: make full use of your time by scheduling your study sessions in 25-30 minute chunks. 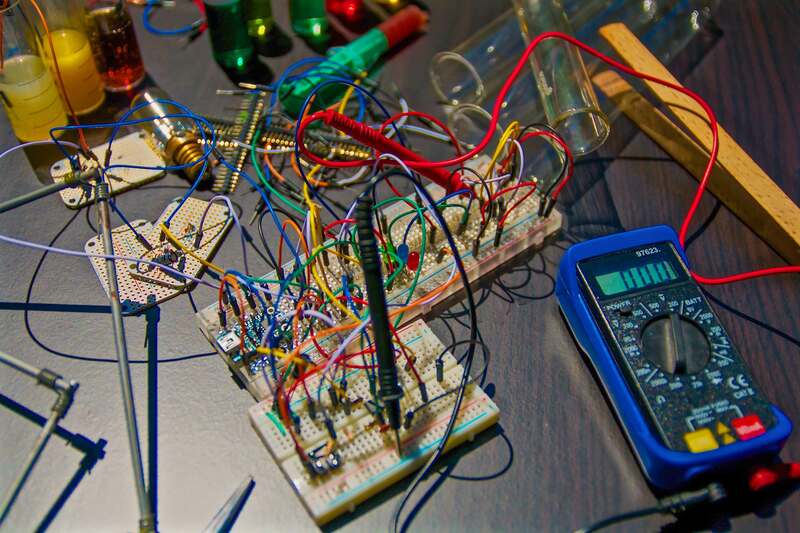 Whichever of the techniques you choose to use, let what you learn in university enrich your understanding of the world. Don’t fall back on rote memorization when the hard times fall in not because it’s inefficient, but because it’s just a waste. Ben Orlin sums it best when writing for The Atlantic, “Memorization is a frontage road: It runs parallel to the best parts of learning, never intersecting. It’s a detour around all the action, a way of knowing without learning, of answering without understanding.” And for all that you have paid for your higher education, isn’t that a sad return for your investment? In the end, it doesn’t matter if the facts fall by the wayside into the black hole. It’s more important that you remember why they mattered. This post was written by Wei Li from iPrice group, a price comparison and meta-search engine based in Malaysia, Singapore, Philippines, Thailand, Vietnam, Indonesia and Hong Kong.